To her biodynamic farming, Lalou brings a unique tasting experience, honed over fifty years buying wines for Maison Leroy, a negociant business founded by her great grandfather in 1868 – now a cellar of almost three million bottles – what some call Burgundy’s Library of Congress! Each year Lalou selects wines from her collection that she deems ready to drink – we are honored to offer these rarities to you now. Bourgogne Blanc, Fleurs de Vignes MV…..
Meticulous in its integration of oak to the texture – ripe fruit, long-lasting favors and fine, laser-sharp finish, a blend of three vintages and three wines: Marsannay ’09, Saint Aubin ’10, and Auxey-Duresses ’11. Montagny 1er Cru, 2006…..From the Southern part of the Chalonnais, typically fresh and taut. Chassagne Montrachet, 2009…..Ripe and rich vintage, refined and supple with a long, seductive finish. Meursault, 2009…..Elegant bouquet and a happy marriage of white flowers, vanilla and citrus notes, of wine and oak – a svelte cathedral of a wine! Puligny Montrachet “1er Cru Sous le Puits”, 2009…..Dense and crisp apple flavors with ample, racy textures. Meursault 1er Cru Blagny, 2009…..Full, ripe and honeyed – great vintage for this village. Chassagne Montrachet 1er Cru les Embrazees, 2008…..Linear and focused, dense and age-worthy, from the southern tip of the village. Bourgogne, 1999…..One of the home-runs of Leroy’s career, this red beauty is magic and proves her purchasing power. Bourgogne, 2003…..Lots of primary fruit from this outstanding vintage and surprisingly meaty and rich for such a humble appellation. Savigny-les-Beaune 1er Cru Les Narbantons, 2011…..Big tannic wine for this acclaimed vintage from a steep, sun-drenched, south-facing vineyard. Auxey-Duresses Rouge, 2005…..A sunny wine which shows its full tannins and attractive red fruit flavors in perfect balance. Volnay, 2009…..Glorious parcel above Mitans just NE of the village – full rich and elegant, bottled by Leroy. Maranges, 2009…..Delightful and comparative bargain considering the pedigree of the vintage and provenance…same slope as a Volnay 1er cru. Chorey-les-Beaune, 2011…..Bright red berry fruit flavors, this wine has plenty of personality and is just getting going – more Aloxe than Beaune in style. Cotes de Beaune-Villages, 2009…..From vines above Meursault and showing all the majesty of their red wine terroir and a top-notch harvest. Santenay, 2009…..Delightful and comparative bargain considering the pedigree of the vintage and provenance…same mid-slope as a 1er cru. Cote de Nuits-Villages, 2010…..A well-sited plot just above the great Richebourg vineyard, a singular wine, fine and complex. Fixin, 2010…..Muscular and massive wine with a velvety texture that seems to go on forever – dark berry bouquet and supple tannins. Nuits Saint Georges, 2008…..A successful vintage here with structure and body, breeding and length – welcome to the party. Vosne-Romanee, 2009…..From a vineyard East of the village with smoky, spicy flavors not typical of Cote de Nuits, and with great structure and elegance. Gevrey-Chambertin, 2011…..Great vintage for Gevrey, with extra concentration from low yields – superb vineyard just N of the village. 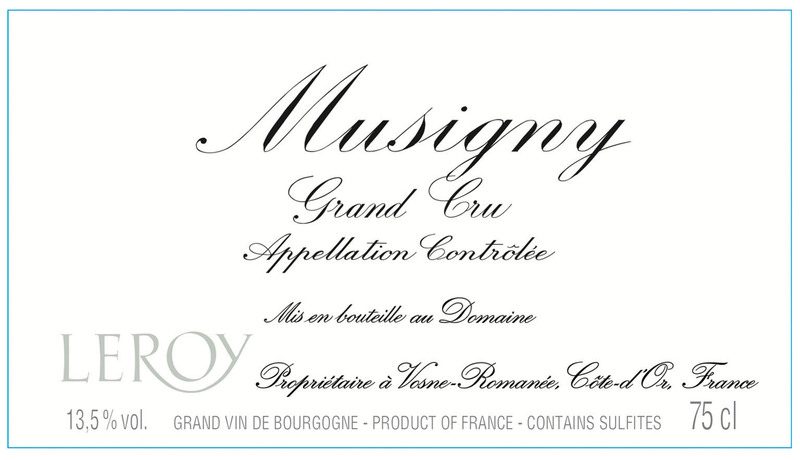 Chambolle-Musigny, 2003…..An exceptional success, ready to be enjoyed now: pure pleasure bottled by Leroy.